You are currently browsing the tag archive for the ‘distant’ tag. After the discovery of Pluto in 1930, there was a long hiatus in discovering objects of comparable size. 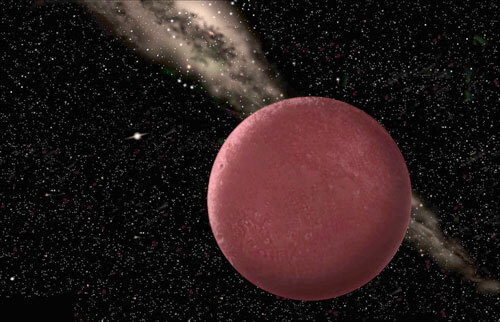 Then in 2003, a team of astronomers led by Mike Brown of Caltech discovered a distant icy sphere which was quickly heralded as “the tenth planet.” Mike Brown announced the discovery on his website along with his team’s rationale for naming the object. He wrote “Our newly discovered object is the coldest most distant place known in the Solar System, so we feel it is appropriate to name it in honor of Sedna, the Inuit goddess of the sea, who is thought to live at the bottom of the frigid Arctic Ocean. 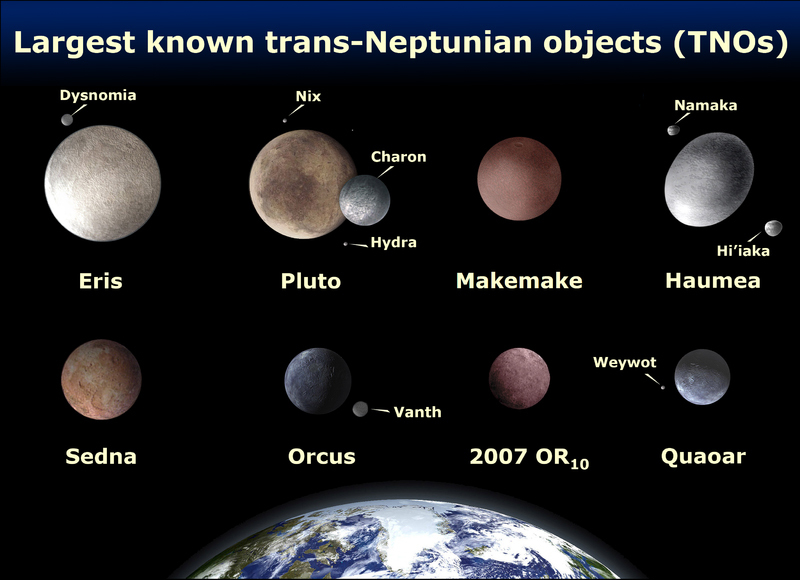 It turns out that Sedna is only one of many similar snowball-like planetoids beyond Neptune. In fact, Ferrebeekeeper has already described the dwarf planet Eris (named after the Greek goddess of Strife) which is the largest currently known Kuiper belt object. Sedna was the first to be discovered since Pluto and it sparked a debate about such objects which ultimately resulted in Pluto’s downgrade to dwarf planet. Sedna also has some unique features which make it remarkable in its own right. 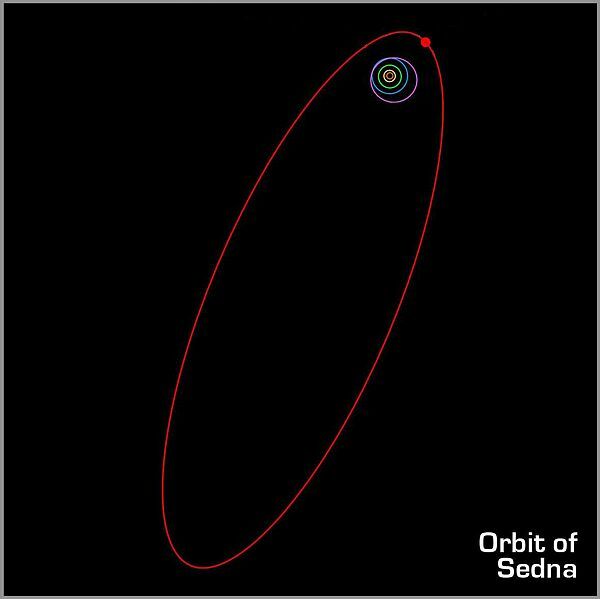 Sedna takes 11,400 years to complete its orbit around the sun and its bizarre highly elliptical orbit has given rise to much conjecture among astronomers. Although some astronomers believe it was scattered into a skewed orbit by the gravitational influence of Neptune, other astronomers believe it originated in the inner Oort cloud and was never close enough to Neptune to be affected by the giant’s gravity. Some scientists speculate that its lengthy orbit may have been caused by a passing star (perhaps from the sun’s birth cluster). A few theorists have gone one step further and conjectured that Sedna is from a different solar system and was captured by our Sun billions of years ago. 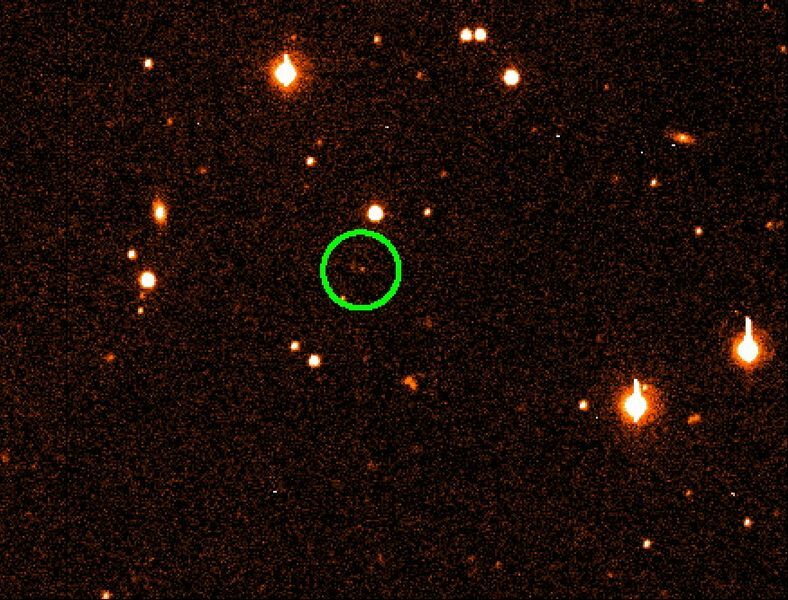 A final school contends that Sedna is evidence of an unknown giant planet somewhere in the depths of space (!). We don’t know much about Sedna except that is probably 1,200–1,600 km in diameter and that its surface is extremely red. After Mars, Sedna is one of the reddest astronomical objects in our solar system. This color comes from the profusion of tholins covering the methane and nitrogen ice of which the little world is formed. Tholins are large, complex organic molecules created by the interaction of ultraviolet light on methane and other simple hydrocarbons. It is believed that early Earth (prior to obtaining an oxidizing atmosphere) was rich in Tholins and they are one of the precursors to the rise of life. During the 1950’s, astronomers using the first radio telescopes started discovering a mysterious class of heavenly objects. Certain discreet points in the sky blazed brightly with low-frequency electromagnetic radiation–yet when the scientists looked at the spots through conventional optic telescopes, it was impossible to discover a source for this energy. Some of these radio flares came from incredibly faint smudges and some issued from what seemed like empty space. Astronomers called the mystery flares “quasi-stellar radio sources” (QUASAR) because they believed such discreetly focused energy must come from stellar-like objects. 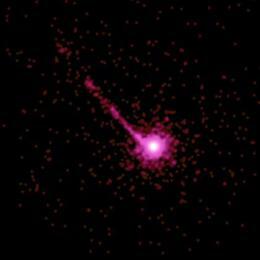 Further study revealed that the photons issuing from quasars were red-shifted, which meant that the quasars were rushing away from the solar system at high velocities. Only in the 60’s did optical telescopes become powerful enough to associate certain quasars with the cores of extremely distant galaxies. The reason no luminous objects were initially associated with quasars was because quasars turned out to be profoundly distant—the closest were billions of light years away. 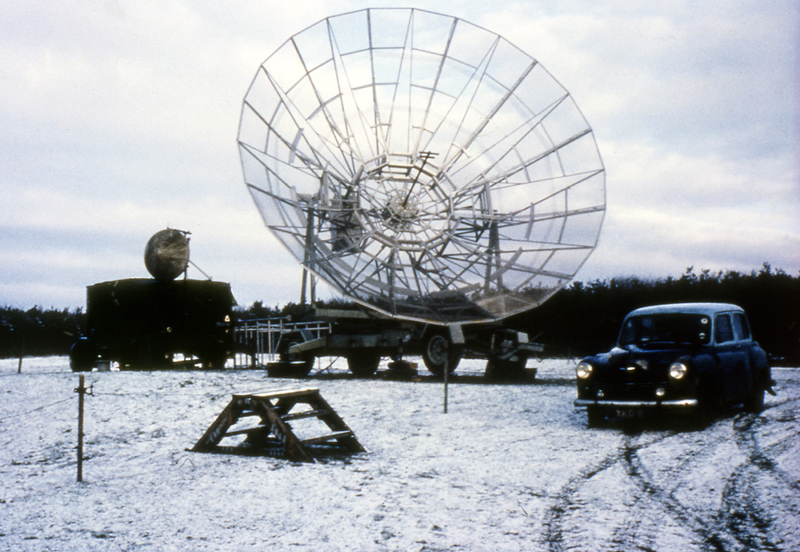 They were visible to early radio telescopes only because of their immense energy output and their beam-like focus. Scientific consensus concerning these massive energy flares did not fully coalesce until the 1980s. 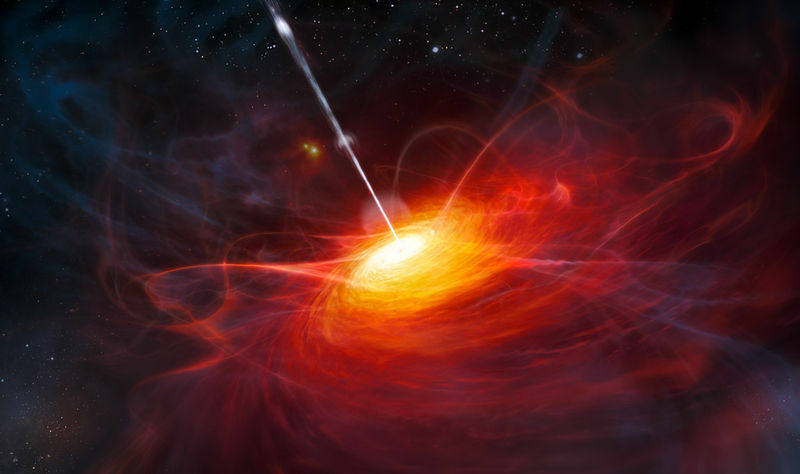 Today astronomers believe that quasars are powered by accretion of material into super-massive black holes which lie at the center of dynamic young galaxies. Such phenomena are called “active galactic nuclei” (AGN). 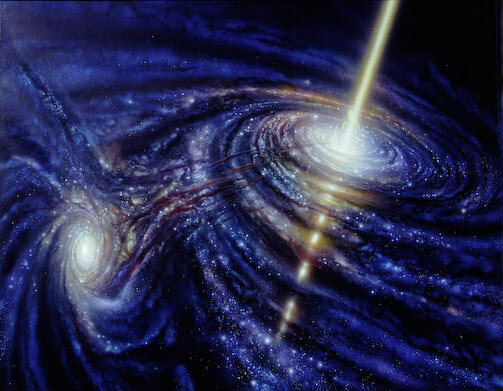 As radio telescopes and time-space modeling grew more sophisticated it became obvious that quasars (which produce low-frequency radiation) were not the only energy flares associated with AGN. Giant beams of different spectrums of electromagnetic radiation are possible depending on the galaxy. Quasars and their ilk produce incomprehensible amounts of energy—the most luminous active galactic nuclei radiate exotic energy at a rate that can exceed the output of an average galaxy by a thousand times (equivalent to the energy from two trillion suns). 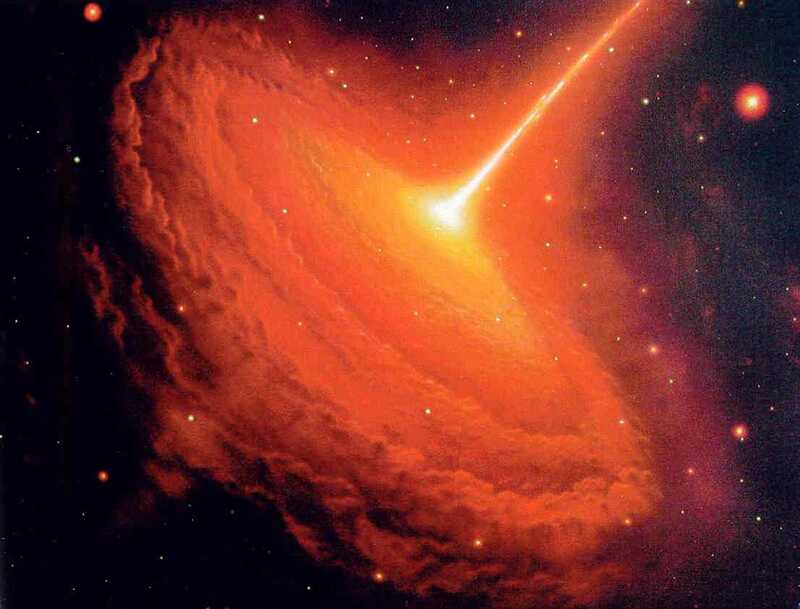 To produce such energy the brightest known quasars consume roughly 1000 solar masses of matter within an earth year (which is equivalent to swallowing/burning 600 Earths per minute). Galaxies change as they age. Today the Milky Way Galaxy is a mostly responsible middle aged galaxy (which only occasionally cuts lose with something crazy like the luminous blue hypergiant Eta Carinae) however there are reasons to think that in the past the Milky Way was a deeply troubled teen-aged galaxy ablaze with self-destructive fury just like the AGN galaxies we see at the far edges of space. Assuming they exist, alien astronomers in galaxies billions of light years away probably see our galaxy as a blazing quasar–because they are looking at its distant violent past. Of course galaxies are not always quiescent. Some astrophysicists theorize that in 3 to 5 billion years, when the Andromeda Galaxy collides with the Milky Way, the black holes in the center of one or both galaxies could begin swallowing up matter (or could merge) reigniting a super bright fountain of high energy particles again visible throughout the universe.